White Dove or White Elephant? who was Cotera+Reed’s project manager for the dormitory. “He’s a prince,” said Reed in response to my question about what it was like to work with the Pritzker winner. Indeed, Aravena is a striking figure and charismatic speaker, as anyone can see from watching his TED talk on how design can answer problems of mass urbanization, carbon-dioxide emissions, and natural disaster. He used this cogent charm to win the St. Edward’s commission. Apparently, Aravena was the only architect to show up to the interview process without a team in place or even the outlines of a proposal, and nonetheless the university administration decided he was the man for the job. 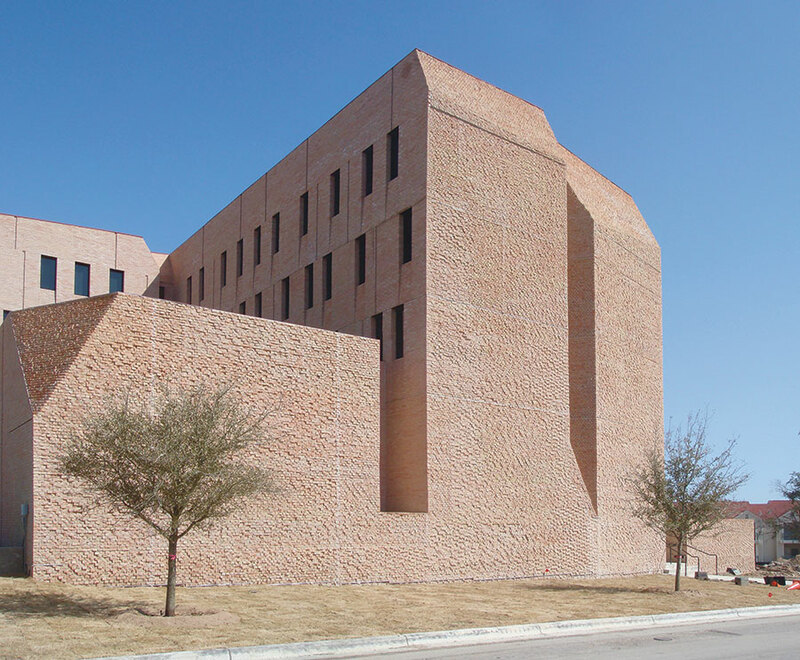 The beige brick of Alejandro Aravena's St. Edward's University dormitory matches the campus's architecture. The building itself is beautiful in just about all the ways architecture can be beautiful—functionally, formally, materially—but its current configuration is not the design Aravena originally proposed. In his first scheme, the structure was completely raised on pilotis, leaving the ground plane open, and it snaked around on itself—sort of a meandering unité d’habitation. The design didn’t win any hearts at St. Edward’s, which has a general look of red, sloped roofs and beige brick that it likes to reinforce. Aravena proved flexible enough to play along, without sacrificing his sensibilities. 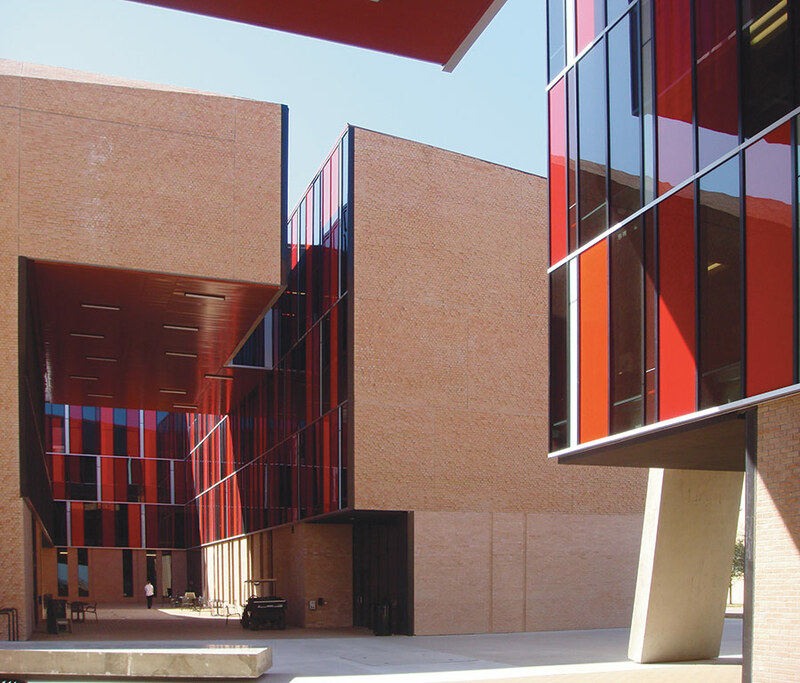 The complex comprises three volumes, two of which are connected via a sky bridge, surrounding a paved courtyard where there are cafe tables. All of the public functions are grouped around this core—energizing the community with open views to what is happening across the way—while the dorm rooms face out to the surrounding campus. It has been compared to a geode, and it’s hard to think of a better description considering the rough brick outer walls and red-glass-clad courtyard. 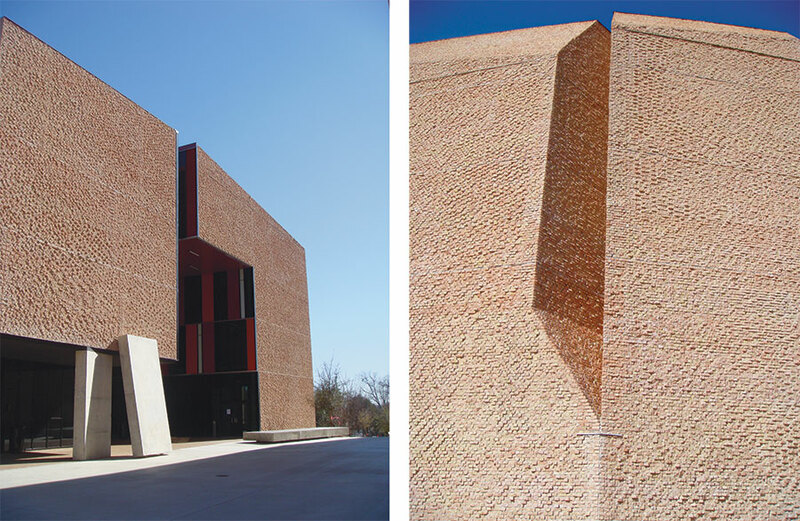 The brick is solid buff Reynoso brick from Mexico, which is made in the old way: hand-molded and fired in scove kilns, resulting in the beautifully variegated surface quality that has been lost to modern brickmaking. Fears about the structural integrity of the material were put to bed with extensive safety tests. Cotera+Reed produced a mock-up of how the outer walls should look, which the masons examined before feeling their way through the process of knocking the bricks in half with a hammer and laying them up just so to achieve the rugged facade texture. That palpable sense of craftsmanship is also present in the glass-curtain wall—no off-the-shelf, cookie-cutter systems here—which was custom designed and fabricated in Chile. Indoors, the reinforced concrete structure is left bare as much as possible, and the minimal lighting—exposed and concealed fluorescent tubes for the most part—is indirect, washing the architectural surfaces rather than the eyes of the students. The dorm rooms are small (“efficient” in real estate parlance), as perhaps they should be, but public spaces sprinkled throughout the facility provide room for the students to spread out, get together for group projects, or just play ping-pong. St. Edward’s has interjected itself somewhat since Aravena left town, installing flat, Sheetrock pilasters between dorm room doors in the single-loaded corridors, breaking the halls up into bays for some reason. “Aravena would hate it!” exclaimed Reed, who saw this addition for the first time during our visit. The one criticism I’ve heard about the dormitory complex is that it’s dark in the courtyard as well as inside. But that’s not a criticism at all. In summer, when it’s 106 degrees outside and the Texas sun is peeling the paint off the hood of your car, a little darkness is a welcome relief. Aravena’s building is also a respite from the mindless, cost-cutting crap that constitutes most housing being built in Austin today—student or no—and a superb example of how exciting good architecture can be. It's time to panic. Well, not panic, maybe, but frown a little bit: after a generally positive showing in 2015, the Architecture Billings Index (ABI) is back in negative territory. 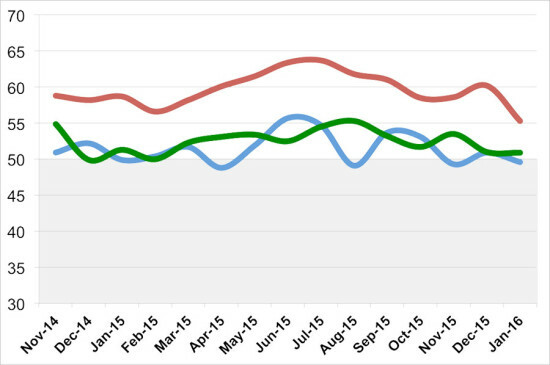 The January ABI score was 49.6, down from 51.3 in December 2015. As AIA Chief Economist Kermit Baker will have you know, any score below 50 indicates a decrease in billings. “The fundamentals are mostly sound in the nonresidential design and construction market,” said AIA Chief Economist Kermit Baker in a statement. “January was a rocky month throughout the economy, with falling oil prices, international economic concerns, and with steep declines in stock market valuations in the U.S. and elsewhere. Some of the fallout of this uncertainty may have affected progress on design projects.” (If these numbers seem to contradict the previous month's readings, that's because each January, the AIA research department updates seasonal factors used to calculate ABI, which results in a revision of recent ABI values. January's new projects inquiry index was down 5.2 points from the previous month, for a score of 55.3. Design contracts were also down, by 0.1, but remained in positive territory for a January score of 50.9. Sector billings were mixed. Multi-family residential billings were down one point, at 51.9, and institutional billings were at 49.9, down 2.3 points over the previous month. Commercial/industrial billings (50.5) were up by 3.2 points, while mixed practice (49.0) rose 2.5 points. The Northeast (50.4) and Midwest (48.9) saw increases of 3.7 and 2.8 points, respectively, while the South (50.3) and West (50.8) saw decreased of 3.0 and 2.9 points. Don't forget: The ABI, the leading economic indicator of construction activity, reflects a nine to 12 month lead time between architecture billings and construction spending. The national index, design contracts, and inquiries are calculated monthly, while the regional and sector categories are calculated as a three-month moving average. 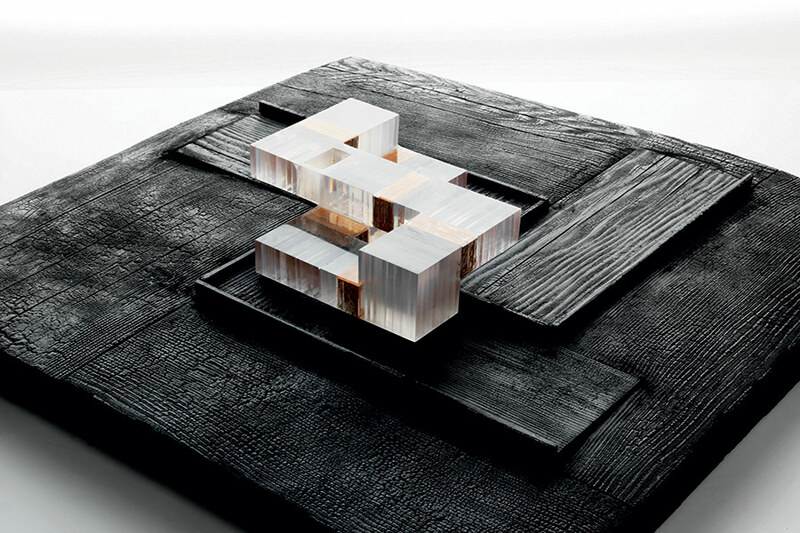 New York museum concept model, 2014. Later this month the Denver Art Museum will present Case Work: Studies in Form, Space & Construction an exhibition of 17 architectural sculptures along with dozens of drawings and sketches created by Brad Cloepfil and Allied Works Architecture. The show is crafty, abstract, and tactile at a time when much architectural representation prides itself on slick realism. Visitors will move through an installation designed and built by the firm that highlights model-like sculptures made out of wood, porcelain, resin, and concrete. Curated by Dean Sobel and organized by the Clyfford Still Museum and the Portland Art Museum, Case Work makes an argument for process and ideation. The show is on view in Denver through April 17 and then will be shown in Portland from June 4 through September 4, 2016. 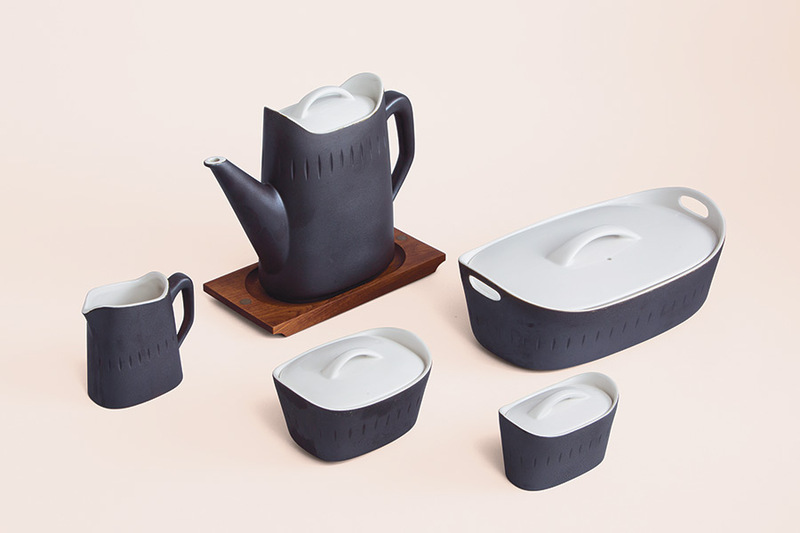 AN’s West Editor Mimi Zeiger spoke with Cloepfil about the works and how they defy today’s image-driven design culture. 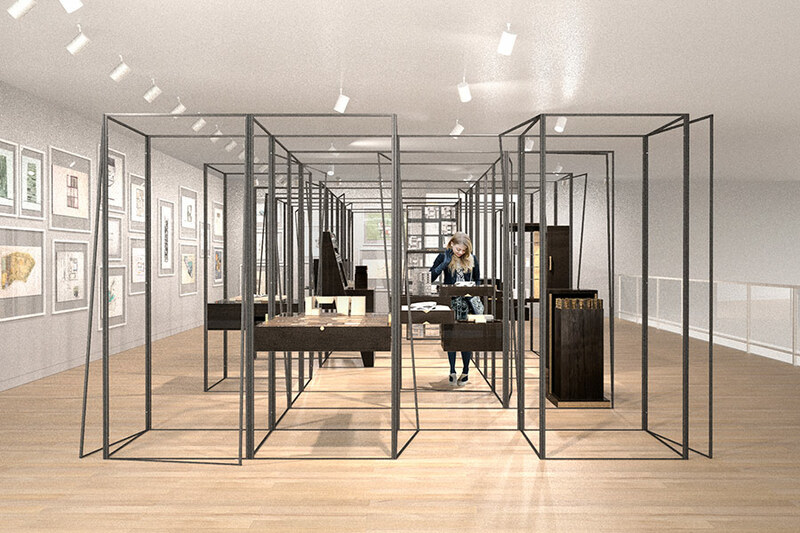 The Architect’s Newspaper: Tell me a little bit about your exhibition Case Work. What was the impetus? Why display this work now? So, I was inspired to finally get my act together and pull the pieces together into a show. That’s really it. It’s nice to show the byproducts of creative industry. Architecture in this particular moment is so much answer an image. It’s resolution focused, so Case Work is a kind of a counterproposal. It is asserting another position. What would you call that position? BC: The architecture is about the exploration of ideas, not the search for a salable image—not the branding of a practice as an image code. Dutchess County Estate - Main House site and massing concept model. Are these objects the output of a series of processes? Each one seems tied back to individual projects, yet each one has a conceptual name, such as Quilted Landscape. BC: We also named one Stairway to Heaven and we’ve named others after rock songs, too. The title paraphrases the search and the element of the search. Because that’s what they’re all for, they’re searching for a kind of spirit—the essence and spirit to what the building is pursuing. When did this kind of work enter your practice? BC: It’s been there all along, going back to the Clyfford Still Museum. We do more of them and use them more as tools now than before. At first they were just incidental to the search and now they’re more intentional. I think that we produce them as markers of the process. You know, architecture is so goddamn hard. BC: Because it’s just so hard, and getting a building built is a four-to-six year process…. Things get so diluted just by the nature of architecture. So, having these crystalline reminders of moments in the pursuit help reference you. They’re reminders of what we’re doing. That’s a pretty tricky position to be in, to operate between art and architecture. How do you feel about being there? Is it comfortable? BC: I love this, this is good. This is kind of what the show is about, by the way, right here, this conversation. They’re pure, creative acts—buildings are much more complex. My goal is to try to get as close to those goddamn models as possible; not just because they’re beautiful sculptural objects, it’s that I want that purity of the idea to get built. That’s all. Wisconsin Art Preserve concept model. And where did the inspirations for each of these pieces come from? I see some mid-century art resonances in the forms and materials. BC: I'm an architect and I'm a maker, so the materials chosen are generated by the ideas we’re pursuing. 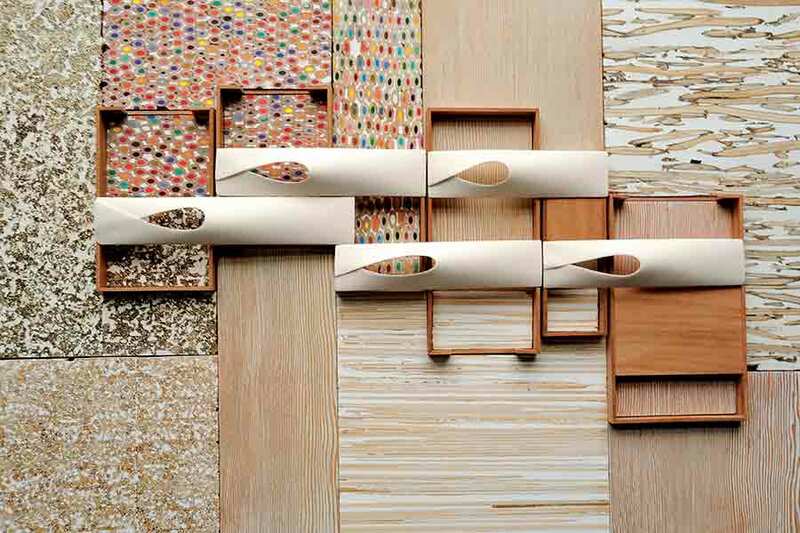 Whether it’s glass or porcelain or wood, they’re just whatever we can use to search for the idea and express the idea. More and more today architects produce a “summary image” and then tweak it along the way. Our process is certainly a counterproposal to that in that we really don’t have a summary image until way, way, way, way into the process—to the discomfort of many clients actually. How do clients react when you present them with an object instead of a traditional model or drawing? BC: [Our process] pushes people, it pushes clients. There’s no question about it. We ask clients to go on this journey with us. And frankly, not every client wants to go on the journey. A lot of them want to know what the damn thing’s going to look like, which is not unreasonable. We’re searching for these ideas and we’re searching for this building, and we’re trying to identify what the building serves from a functional point of view, from a cultural point of view. Any building can house functions, right? We’re trying to figure out why a building needs to exist. For Todd Gannon, Ultramoderne's lakeshore kiosk offers perspective. 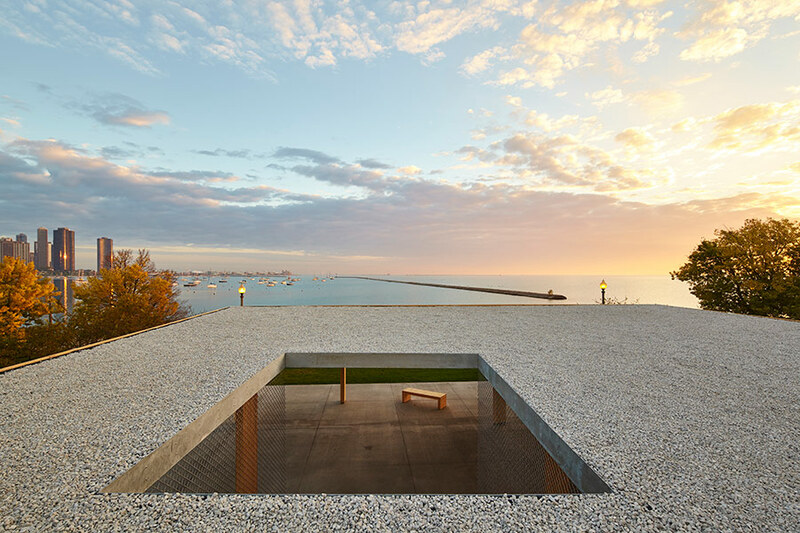 The first Chicago Architecture Biennial—curated by Sarah Herda and Joseph Grima and staged at the Chicago Cultural Center and other venues throughout the Windy City— opened to great fanfare October 2. The events drew throngs of architects and journalists from around the world; a formidable sampling of the Chicago’s political and social elite; and, perhaps most importantly, a strong showing from the general public. 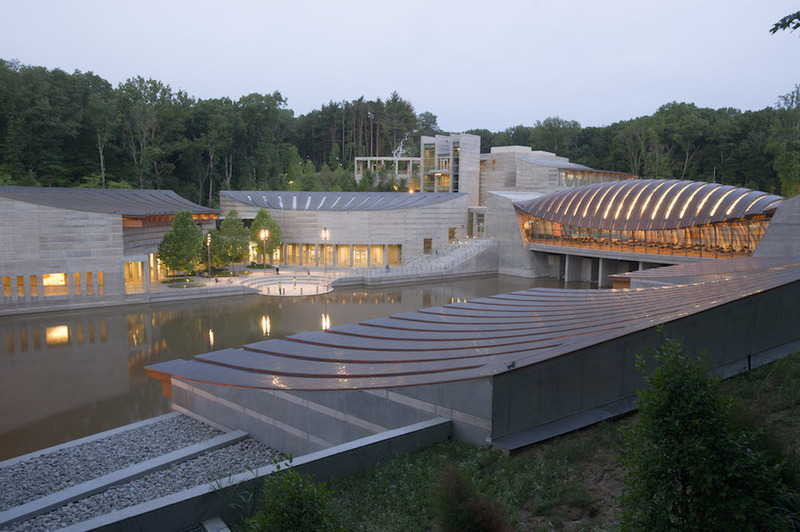 There were more events than even the most dedicated biennialist could attend, and the whole affair was without doubt a boon to architecture culture in the United States. It was also enough to make one wonder if the designers gathered to represent the titular State of the Art of Architecture might be a little too comfortable in the territory they have staked out at the fringe of the discipline. Though the breadth of the exhibition made it difficult to determine a clear curatorial position, much of the work on display loosely clustered into two opposing camps: the snarky neo-postmodernism that has become fashionable with young American designers climbing the tenure track, and the earnest output of mostly international practices seeking to affect change in underprivileged locales around the world. There was strong work on both fronts. 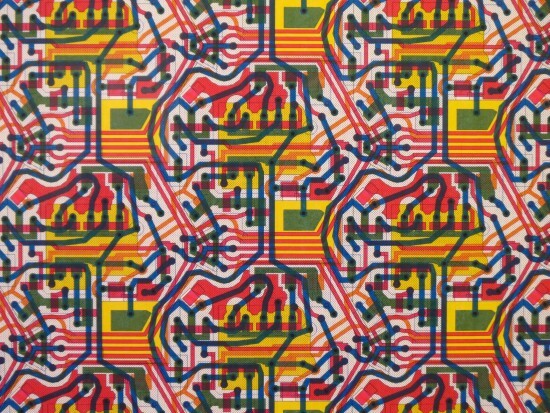 Amanda Williams’s “Color(ed) Theory,” for example, advanced a subtle yet biting critique of racial and economic imbalance by painting a series of destitute structures on Chicago’s South Side in bold colors. Norman Kelly’s “Chicago: How Do You See?” drastically altered the complexion of the Cultural Center’s flamboyant Michigan Avenue facade by augmenting its fenestration with vinyl caricatures of historically significant Chicago windows. Both projects stood out by virtue of the forceful impact each made on the fabric of the city. Too many other participants seemed content to exhaust the efficacy of their work within the gallery walls. Consider the wealth of socially motivated data gathering and photo documentation on view. Just about all of it was not only statistically but also architecturally irrelevant. Besler & Sons provided a neo-pomo complement with “The Entire Situation.” A meditation on the unconsidered ubiquity of cheap construction materials that invited comparisons to the early work of Frank Gehry, this hermetically self-contained piece had none of the punch—because its designers took none of the risks—of Gehry’s early experiments with corrugated cardboard and chain link. In spite of the interactive fun of the “StudFindr,” programmed by Satoru Sugihara and situated on the adjacent wall, the most lasting takeaway from “The Entire Situation” was the hilarious, if unintended, irony of its title. My quarrel with the neo-pomo and “neo-critical” projects that dominated the biennial has less to do with the self-indulgent frivolity and self-righteous banality to which its authors so often succumb than with the fact that so many talented architects set their sights so low. Such was the case with the full-scale “houses” by Tatiana Bilbao S.C. and Vo Trong Nghia Architects on the third floor on the Cultural Center. Each architect wagered on cost-effectiveness as the driving force of their design, and each delivered results that, however laudable their social aims, ultimately underwhelmed as buildings. Bilbao’s scheme, admittedly, was a prototype for projects rendered in somewhat more substantial materials (several have been completed in Mexico), but given that it and Nghia’s scheme were presented as “real projects” tackling “real issues,” their failure to compel conviction as architecture was all the more problematic. Each gave the impression of a nose thumbed at more aesthetically driven projects in the exhibition, and came off as less serious than cynical. With “Corridor House,” the third full-scale “house” on the third floor, Michael Meredith and Hilary Sample of MOS offered a canny counterpoint to Bilbao’s and Nghia’s efforts. Though the architects paid lip service to the idea of affordability and ease of construction (particularly in interviews with trade publications), they also made much of the project’s status as an oversized and meticulously crafted model. Fantastically ersatz “boulders” (stitched together from paper sheets printed to resemble stone) along with cheekily reimagined interior furnishings completed the scene. A provocative meditation on the necessary artifice of architectural design, the scheme proved far more engaging than its purportedly more engaged counterparts. For all the tension on the third floor, the most exciting projects in the exhibition were located outside the neo-pomo, neo-critical dyad. The Swiss firm Gramazio Kohler joined forces with the MIT Self-Assembly Lab to stage “Rockprint,” a productive mash-up of robotic fabrication, material science, and a hell of a lot of gravel. 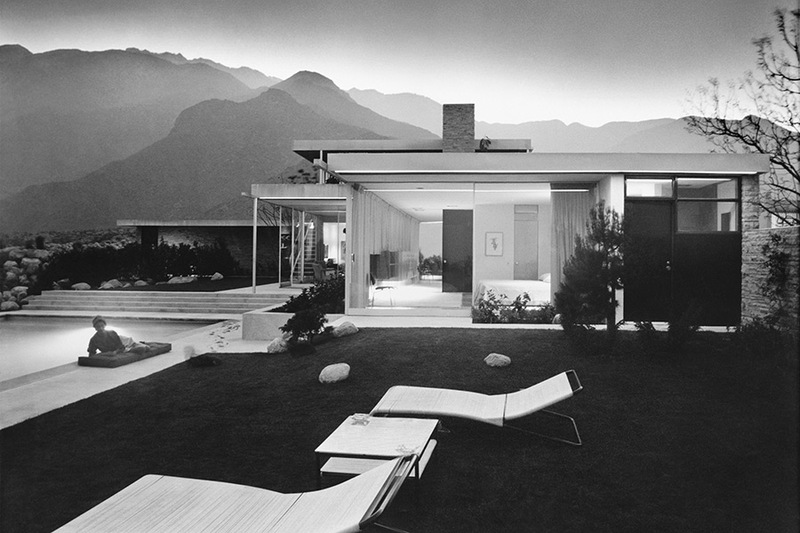 Los Angeles-based Johnston Marklee assembled an arresting collection of their own photo collages and artful images of their completed buildings by photographers including James Welling, Livia Corona, and Marianne Mueller. “In Oblicuo,” a multi-panel presentation of several competition projects in Budapest, architects Marcelo Spina and Georgina Huljich of PATTERNS joined forces with Casey Rehm to produce a striking re-imagination of the border between abstraction and photo-realism. Tomás Saraceno’s nearby spider web constructions were just plain cool. Some of the most satisfying projects were also the most straightforward. Junya Ishigami’s exquisitely spare models of the Kanagawa Institute of Technology were a case in point, as were designs for environmentally sensitive campsites rendered in drawings and an impressive model by the Canadian firm Lateral Office. 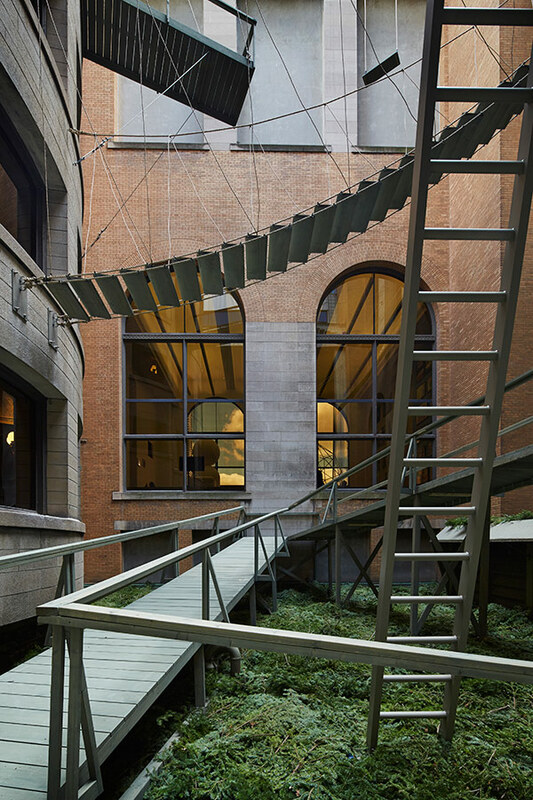 Also notable was Atelier Bow Wow’s “Piranesi Circus,” which filled the Cultural Center’s inaccessible courtyard with a series of catwalks, ladders, and platforms designed, according to the architects, with circus performers and, in another nod to postmodernist themes, “imaginary prisoners” in mind. To my eye, the scene suggested not only the collision (and collusion) of entertainment and entrapment but also, via the precarious ladder which drew visitors’ eyes up past the cornice line to the sky above, the possibility of a way out. After several hours at the biennial, the suggestion of an exit was a welcome gesture. I, for one, was jonesing for actual buildings. The Cultural Center itself, which proved that architecture can be both frivolous and substantial, offered welcome respite, as did “Making Place: The Architecture of David Adjaye,” the handsome retrospective assembled at the Art Institute of Chicago by Okwui Enwezor and Zoë Ryan. So too did the opportunity to duck out to revisit nearby masterpieces by the likes of Sullivan, Wright, Mies, and Gehry. Getting out was a good thing, for it was well beyond the main venues that I found clearest presentation of the confidence and optimism I had hoped to find at the heart of the biennial. “Chicago Horizon,” the elegantly understated pavilion assembled by Ultramoderne just above the ominously churning (at least when I visited) Lake Michigan, powerfully suggested that The State of the Art of Architecture might best be sought not in the turbulent froth of a directionless present, but rather in those rare and remarkable buildings that lift us above the fray to direct our attention toward the more profound possibilities of an unknown horizon. Three live music venues compose the new bayou-side complex. Austin, watch out: Houston may be the live music capital of the world one day. 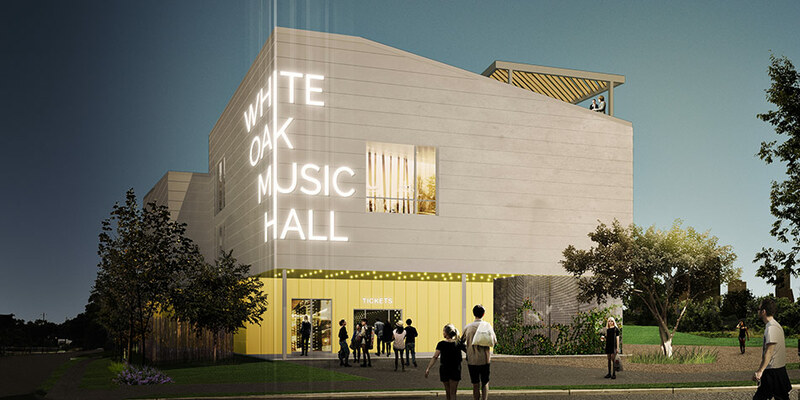 Pegstar Productions, one of the largest concert promoters and organizers in the Southwest, sought out Houston– and New York–based firm Schaum/Shieh to design White Oak Music Hall, a three-stage showcase for independent music. 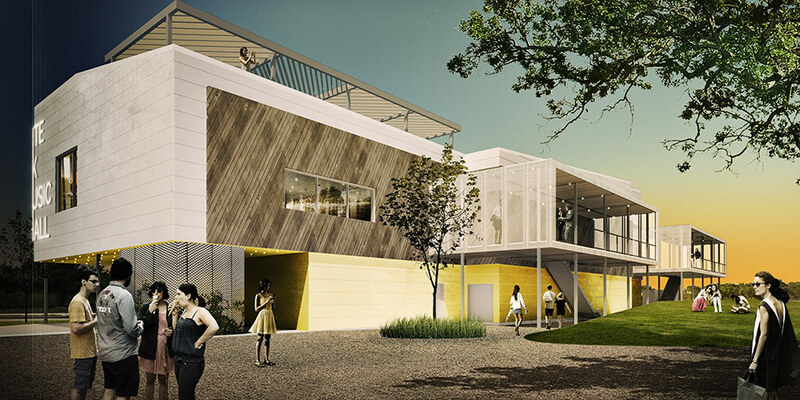 The performance complex sits on a roughly five-acre site, adjacent to the Little White Oak Bayou, just one mile from downtown. Architect Troy Schaum believes that the civic aspect of the design is one of its best features. “The client wanted a world-class venue, looking a little more broadly for inspiration. Houston is not just a local city, it’s a global city.” Indeed, if demographic trends continue, Houston will overtake Chicago as the country’s third largest city by 2030. “Nobody builds ground-up indie rock clubs...We are imagining what contemporary users want, [and creating] what that would be,” said Schaum. 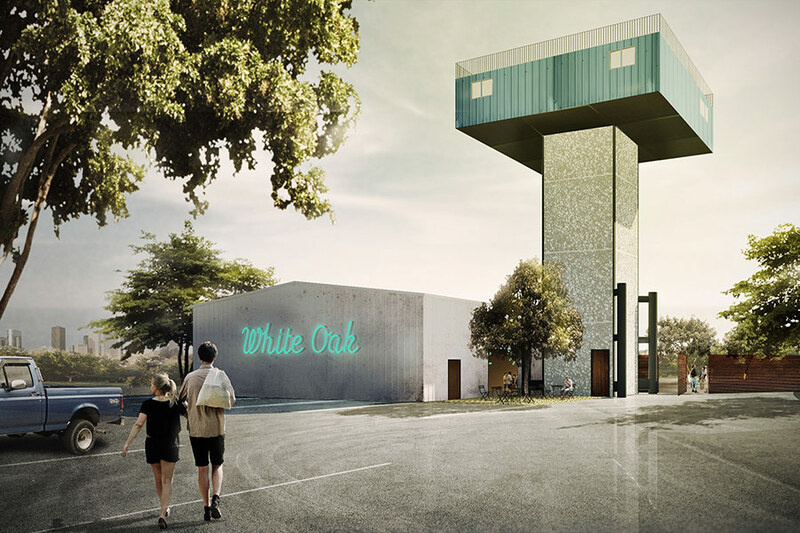 White Oak’s design reflects Houston’s increasing prominence on the global stage while remaining true to the local culture. To create the three venues, 15,000 square feet of interior space is broken up into a 1,000-seat music hall and a more intimate 200-capacity stage. Outdoors, over 2,000 music fans can congregate on the lawn, where gently sloping turf affords excellent views of the bayou and downtown Houston. 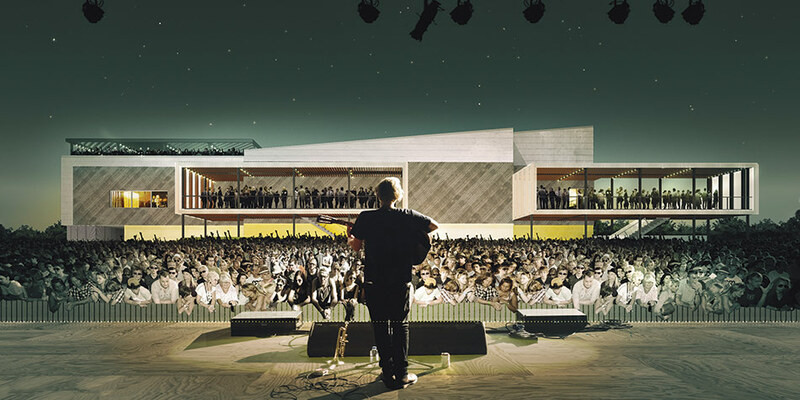 Large exterior balconies and a roof terrace create a loose amphitheater around the lawn’s main stage. The outdoor program synthesizes the bayou and the city, reinforcing Houston’s connection to the water. Hills are rare in this part of Texas, so Schaum/Sheih capitalized on the site’s slope to catch Little White Oak Bayou’s breezes. This, in addition to plantings and shade from the balcony, will cool concertgoers on the lawn. Also part of the complex is the Raven Tower, a local landmark visible from the adjacent I-45. The six-story tower is topped by a former bachelor pad and weathervane with an oversized metal rooster. The tower will be turned into a bar that references a Houston ice house—a roadside bar that sells bottled beer. The project is expected to be completed by May 2016. David M. Schwarz Architects, Inc. Washington, D.C.
Martinez + Johnson Architecture Washington, D.C.
* denotes a landscape architecture firm. Staten Island Zoo Carousel Enclosure 614 Broadway, Staten Island Slade Architecture Our intrepid Archtober team ventured across the New York Bay to usher in the weekend with a visit to the Staten Island Zoo. After a breezy ferry ride (along with some time on the subway, bus, and our own two feet), we met up with James Slade, who, together with his wife and partner Hayes Slade, designed the Staten Island Zoo Carousel Enclosure. Ken Mitchell, zoo director, stopped by to give us some information about the zoo, which opened in 1936 and had 190,000 visitors last year. A master plan developed by Gruzen Samton had called for the carousel to be located near one of the zoo’s entrances, but James and Hayes decided instead to site it closer to the central building and facilities, near the children’s zoo and reptile house, two highlights of the facility. The Department of Cultural Affairs manages the buildings and zoo, while the Parks Department owns the land. All parties involved agreed that it was important to minimize impact on the landscape, which includes many mature trees. They avoided deep excavation work by setting the carousel enclosure on a diamond pier foundation system in which metal pins are hammered into a base to create a pincushion effect. Only one tree was lost to the carousel, leaving a verdant canopy above. Young riders can look up and see the sky through the ETFE roof, which lets in light so that passersby can admire the fine craftsmanship that went into the hand-carved and hand-painted wooden animals. 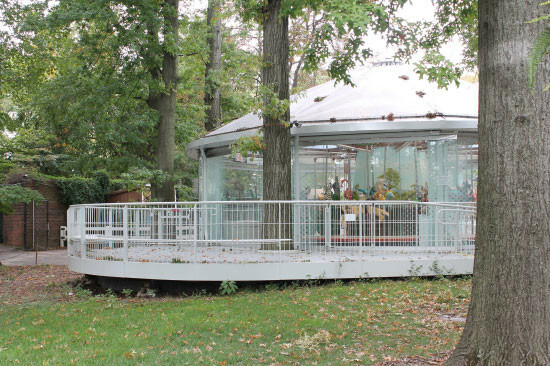 An ingenious system of sliding glass panels allows the carousel to be used year-round. Mark Lombardi, facilities director at the zoo, is especially pleased with its design. He appreciates that in addition to being beautiful, the system is also easily maintainable. The panels slide into place with little effort, and they help keep the environment comfortable in all weather conditions. 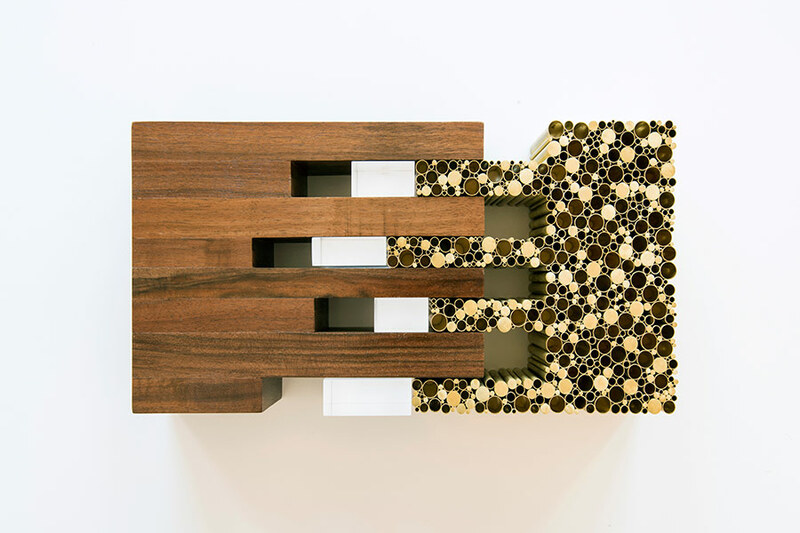 A playful custom frit pattern alerts visitors to the presence of the enclosure, which might otherwise fade from view, which is exactly the structure’s purpose. As Slade remarked, “it’s a building, but it’s really about having the building disappear to highlight the carousel inside.” The leopards looked like they wanted some attention, so Slade took us over to see the enclosure that his firm had also designed. After spending most of their lives in an indoor exhibit, the leopards are finally free to roam outside in their spacious new home, which was created with environmental enrichment in mind. Climbable trees and deadfall encourage mental stimulation and physical health, while a heated rock by the observation area provides a cozy spot in cold weather. When the leopards want to get away from human eyes, they can retreat to hiding places that were designed into the space. We’ll be back in Staten Island next week to see the newly-opened Staten Island Museum at Snug Harbor. Join us tomorrow for Editions de Parfums Frédéric Malle by Steven Holl Architects Julia Cohen is the Archtober Coordinator at the Center for Architecture. “It was important to do away with the corners,” stressed Rafa Esparza, as we walked through his immersive work entitled i have never been here before, under construction and on view at LACE, Los Angeles Contemporary Exhibitions, on Hollywood Boulevard through September 13. Esparza, a Los Angeles–based multidisciplinary artist, is busily transforming the gallery by building two curving adobe brick walls. His construction is a tour-de-force meditation on the place of art, the labor of bodies, and the steadfast mobilization of communities—as both witnesses and collaborators. The exhibition, curated by Shoghig Halajian, began inconspicuously enough on July 8. 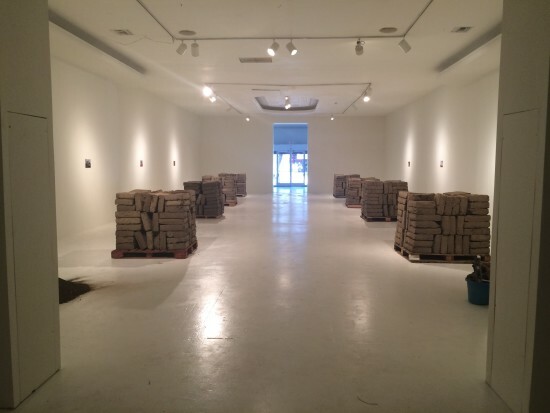 Visitors familiar with Esparza's previous performance works for site-specific environments were greeted by a roomful of several hundred bricks, installed in six cubic stacks on construction pallet plinths, as if awaiting further instructions. These neat volumes, described by Halajian as “contained objects, stripped of their labor,” were the first batch to be transported from the Bowtie Project site along the L.A. River, epicenter of the brick production that itself was a key performative component of the work. There were also eight unframed color photographs on the walls, depicting the artist in the same room at an undefined earlier moment: crawling at bucket-level, mixing messily, kneading muddy earth across a marked-up floor. The process of making adobe bricks is methodical, the manual labor physically demanding. Esparza is working together with extended family members alongside local collaborators and—most notably—with his father, from whom he inherited the knowledge of the construction technique. Together at the Bowtie site they dig out the earth and sift out the rocks. Manure and hay are culled from the stables of a family friend in the San Gabriel Foothills. Water comes straight from the river nearby. After mixing everything to get the consistency just right, it’s poured into twelve-by-sixteen-by-four-inch wooden molds. Despite what may seem like a drawn-out ordeal, Esparza adds, “I actually feel like we've been moving at a quick pace, but more importantly, it’s our own pace.” Each brick hardens in open air for several days before the team stacks and trucks them over to LACE’s bustling Hollywood Boulevard location along the Walk of Fame. There, the team work the walls up to their projected ten-foot height. “My dad doesn't like it when I use the cracked bricks,” says Esparza, picking one up from a new shipment. “But I'm going to use all of them!” Ricardo Bracho, a theater artist who comes by for a meeting, chimes in: “Yes! Even the ugly ones! Little by little it all becomes one big brick.” Course by course along the cracks and connections, Esparza trowels on adobe in slip form as a mortar. You might arrive to find the team mid-task and strike up a conversation. Other times they’re off on lunch or running a shipment across town: tools, wheelbarrows, and water pails are strewn about, and the radio is left on. With i have never been here before, Esparza’s form of architectural address is to welcome everyone into a place that is at once strange and also strangely comforting. He recalls a recent encounter, which encapsulates his thoughts on art and its accessibility: “The other day we were out on Hollywood Boulevard pushing a wheelbarrow full of bricks into the gallery, and a family there stopped me and asked, in Spanish, what is this doing here? We had this instant connection. And it's the same people who might feel distant from what galleries give and do. I'm looking at who can have an immediate response to the earth, to this material.” “At times like this, it feels almost inappropriate to make work inside here,” says Esparza of the gallery space. But the key word here is “almost.” It girds his skepticism about institutional norms at the same time that it fuels an ambition to engage them head-on. “If we are talking about changing these spaces,” he asks, “what really are the alternatives? Can we imagine them? What do they look like?” Without prompting, he adds: “I wasn't thinking about architecture specifically when I began to use bricks—just about space.” The statement is accompanied by a mischievous look: it’s true, to be sure, but Esparza’s previous works have often taken forms that relate directly to specific architectural acts, whether through their material makeup, their social position, or the symbolic heft. For a recent work, located next to the Twin Towers LA County Jail, Esparza’s standing body was encased in concrete to chest-height, after which he chiseled himself free; for another, a performance at the Getty, he ferried himself across the travertine courtyard via adobe tiles, dressed in a spacesuit. He draws attention from these structures of power, outdoors and in public, and distributes it back to the labors of the individual or collective body: whether it’s a body nearby it, or pushing against it, or talking with, or getting up in the face of it. As the work casts new light on vernacular building materials and processes, Esparza also seeks to wrest both institution and visiting audience from their respective comfort zones. “It is in some ways an uncomfortable project,” Halajian says. “On a basic administrative level, we're constantly having conversations about the level of dirt—how we're treating and preparing the space. For example, do we clean daily or cover it up? Do we deal with the trails in and out of spaces, into the back and the project room? How do we address our boundaries?” And the title? Esparza grins, quickly clarifying: “I've actually been here plenty of times!” He describes how his first performance in a gallery was at LACE in 2010, for the marathon performance event Gutted. “Actually it was here that I received my first truly inspiring experience of a community of makers. To find myself surrounded by this, I thought to myself, this is my education! So I have been here before, but I am imagining it as a new place, one that draws on a history, a labor, a class, and an architecture—all of which I wanted to be responsive to.” But the humility in his response foregrounds the title’s proposal: how can we inject even familiar spaces with new, unfamiliar energies? Appropriately, i have never been here before will serve as the backdrop for the Resonant Forms festival during its final weekend, featuring an impressive array of experimental sound and performance artists. At exhibit's end, Esparza plans to chisel out, store, and ultimately repurpose each of the five thousand bricks.